Yes kiddies, once there was a time before every other character on Saturday Night Live who has a calculated look and a half-baked catchphrase could snag a movie deal. It had to start somewhere, and that somewhere was circa 1979, when director John Landis—coming off one iconic comedy, Animal House—helmed yet another classic, literally given the keys to the city of Chicago to wrangle the expansive car chase/musical entity known as The Blues Brothers. 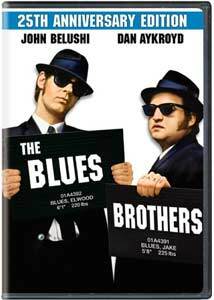 Dan Aykroyd and John Belushi took their SNL alter egos of Elwood and Jake Blues, respectively, and working from what was originally a towering 300-plus-page script from Aykroyd, turned those characters into two of comedy's most recognizable characters, decked out in the de rigeur uniform of dark suits and sunglasses. Universal has, for the 25th anniversary, put the original theatrical cut and the extended version (running roughly 15 minutes longer at almost 2-1/2 hours) on a two-sided disc with a smattering of extras, some old and some new. The extended version fleshes out a couple of jokes in a bit more detail, adds an explosion, and a couple of the musical numbers run on a bit longer. The setup is wholeheartedly flimsy, a variation on the old "let's put on a show" plot device, with Elwood and Jake working to put their old band back together in order to raise the dough to save the orphanage where they grew up. Their travels to round up their cohorts has them crossing paths with all manner of musical giants, including appearances by Ray Charles, Aretha Franklin, James Brown, and Cab Calloway (among a multitude of others), which means no shortage of singing and dancing wedged in between car chases, crashes, and wholesale destruction. Oh, and there's the dreaded Illinois Nazis, too, led by a hatemongering Henry Gibson. This whole thing is an admittedly weird juxtaposition of concepts, part comedy, part car chase, part song-and-dance movie, and as a film made before the CG boom, all those wrecked police cars were busted up the old-fashioned way, something that makes this all so much larger than life, even 25 years later. And it is that pile-it-on excess, a kind of altered madcap reality, which, when coupled with Landis' all-access pass to filming just about anywhere he wanted in Chicago (which since has never looked better on film), makes this almost a throwback to the big roadshow pictures of the late 1950s and early '60s. There is so much going on that Aykroyd and Belushi are almost overshadowed by the city, and especially by the likes of Aretha, Ray, and Cab. I logged a lot of time at the Dixie Square Mall in Harvey, IL in my youth, back in the day when "malls" weren't quite as common as they are now. For reasons unknown to me, Dixie Square went belly up and abandoned, eventually finding permanent landmark status in the world of The Blues Brothers when Jake and Elwood literally demolish it during one of the film's most extravagantly destructive sequences; that sort of cemented a base connection with me that has always given this movie a special attraction. But, no it isn't just the presence of a boarded up mall rebuilt to be razed in a movie. That would be rather goofy. It's more in the way it notches in with all of the other large Chicago locales and how Aykroyd and Belushi seemed just as large in those dark suits. They made monosyllabic utterances reek of cool, and they didn't need to deliver reams of jokey dialogue to do it. Image Transfer Review: Both the extended and theatrical cuts are presented in 1.85:1 anamorphic widescreen. The film does look best during the daylight scenes, where colors really stand out the strongest (such as the red flags of those damn Illinois Nazis), with no trace of smearing or blocking. Black levels do get a bit muddy, with shadows swallowing some elements of the picture detail during certain scenes. There is quite a bit of fine grain, and few small age-related nicks (more evident on some of the "extended" footage) guarantee this will never win any awards for pristine transfers, but it does look better than a lot of 25-year-old features. Audio Transfer Review: The extended cut sports a solitary Dolby Digital 5.1 surround track, where as the original theatrical cut gets treated like second-hand news, with 2.0 tracks in English, French or Spanish. So what that means is that if you're really looking for a little extra to enjoy the musical numbers it's the extended cut, as the songs come across fuller and with a deeper kick, which is noticeably lacking during some of the chase sequences. Dialogue is serviceable and clean on either mix, though not much in the way of directional movement on either side. Extras Review: If you picked a copy of the "collector's" edition a few years back, you'll find the same The Stories Behind the Making of The Blues Brothers (56m:10s), but that's alright because it's a good one. Split into 14 chapters, with titles like "Creating the Myth," "The Bluesmobile," and "Shooting in Chicago," this comes close to being a wee bit of full glowing remembrances in spots, but it's also full of some great stories, behind-the-scenes footage, and Landis talking about trying to make a film with car crashes and songs so that it would "compute" with viewers. The theatrical version side houses some new stuff, including an awkward Introduction by Dan Aykroyd (:24s), where the former Elwood Blues looks just a bit too happy as tells us to enjoy the film. Going Rounds: A Day on The Blues Brothers Tour (07m:06s) was shot in May 2005 in San Diego, and features Aykroyd and Jim Belushi doing their whatever-it-is Blues Brothers-esque act, in a segment most memorable for having very mediocre sound. Transposing the Music (15m:17s) has interviews with Aykroyd, Paul Shaffer, Howard Shore, Landis, and Jim Belushi (among others) talking about the origins of the act and their love of the blues, but is really worth a look just for some vintage SNL footage of the elder Belushi singing like a madman in a bee costume. Remembering John (09m:40s) has Judy Belushi-Pisano telling how she and John met, and most of the other principals fondling recalling the late comedian. Ten brief screens of text production notes and a full-frame theatrical trailer are included. For some odd reason both versions feature a section called Musical Highlights, which for all practical purposes is just a set of chapters to take you right to the music, but that takes all the fun out of a film like this. Both versions, despite differing runtimes, are split into 18 chapters each, with optional English, French or Spanish subtitles. Maybe it's just my born-and-raised-in-Chicago-itis coming through, but it almost seems unnatural to not be sucked in by the manic exuberance that Landis paints on here in thick, blues-based coats. Belushi and Aykroyd turn their SNL characters into something infinitely larger than life (take that Stuart Smalley and Pat), and they manage to hold their own onscreen with Aretha Franklin, Ray Charles, and Cab Calloway. Just on noisy excess, The Blues Brothers merits a spot in every well-rounded DVD collection, and this 25th anniversary edition offers up both the theatrical and extended cut of the film.